Reers et al. had noticed that their zebra finches tended to feed not just their own young but others as well. They thought this was quite odd as voice recognition is quite well developed in zebra finches. So they decided to find out what was up. They recorded the call of fledgling finches and played it back to their parents along side recordings of strange fledglings. They noted the parents’ response in terms of number of calls and latency to call back to either their own young or the recordings of strange chicks, and used this for analysis. The authors mention that these measures are a well established method for detecting recognition in zebra finches. They did some Poisson error mixed effects generalised linear models using the lme4 package in R to analyse parent recognition data. They also did something fancy to test for individual variation between fledglings (wouldn’t be much good if they all sounded the same). Here’s what they found: The fledglings did sound different from each other, so recognition of individuals ought to be possible. Also, the parents did not respond any differently to strange chicks than they did to their own. Now that’s interesting. It would seem that either parents are not able to recognise their own fledglings from their voices or they don’t care if what they hear is their own kids or not. 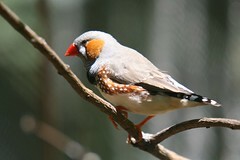 The authors think that more study is necessary, because as they point out, zebra finches are known to recognise other calls and even human voices. They had also observed a lot of false feedings in aviaries (that is, the adults fed strange chicks). The authors think that we don’t understand recognition well enough, and although I can see how possibly a sequence of communication may be necessary, it could also just be that the parents stop caring who’s chicks they’re feeding once the chicks reach a certain age. I don’t know enough about zebra finches to have a qualified opinion on the matter, but I certainly think that the false feedings seen in their aviaries would suggest that individual recognition is not so important in some cases. ← ASAB Here I come!